This unique evening of art and music will bring together an eclectic mix of fresh new talent. The Perth Advocates for the Earth in collaboration with well-known local musician Dilip Parekh and talented artist Carolyn White have planned an evening that will showcase artistic visual and aural interpretations of nature’s beauty. The proceeds from this event will go to the Save the Kimberley organisation, a group that was set up to educate the Australian and international community about the threat to the Kimberley Coast and its inland wilderness areas posed by large-scale industrial developments. Musical treats include Dilip n DAVs Trio w Kirsty Hulka, Bryan Rice Dalton & Shane Corry, Wayfarer, Rachel Dillon, Timothy O’Farrell, and The Tonic interspersed with humorous interludes from Tien Tran (award winning comedian) and the comedic sauciness that is the Vintage Reds Burlesque Duo. Adrienne Stewart – uses flax (long grass bushes) and paintings which include a combination of copper wire and beads to highlight the finishing touches of her creations. Anna Willoughby – works primarily in the medium of printmaking, sculpture and drawing, reflecting on relationships between animals, environments, images and memory. 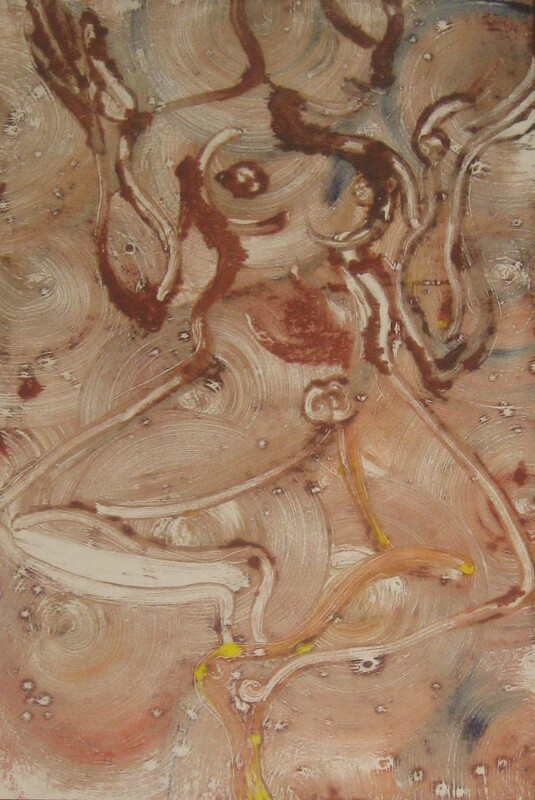 Anne Margaret Duff – uses traditional and non-traditional mediums that relate strongly to her subject matter. Anne has recently been exploring the expressive use of grass tree resin and native soils collected from the fire affected areas of Toodyay and Gnarabup. Christina Paul – designs objects that are sculptural in floral, wire, paper, mosaic, textiles, paper and jewellery. David Williams – uses mixed media that explores the lighter, more humorous aspects of life, as well as the darker side of mankind’s relationship with animals & the planet. 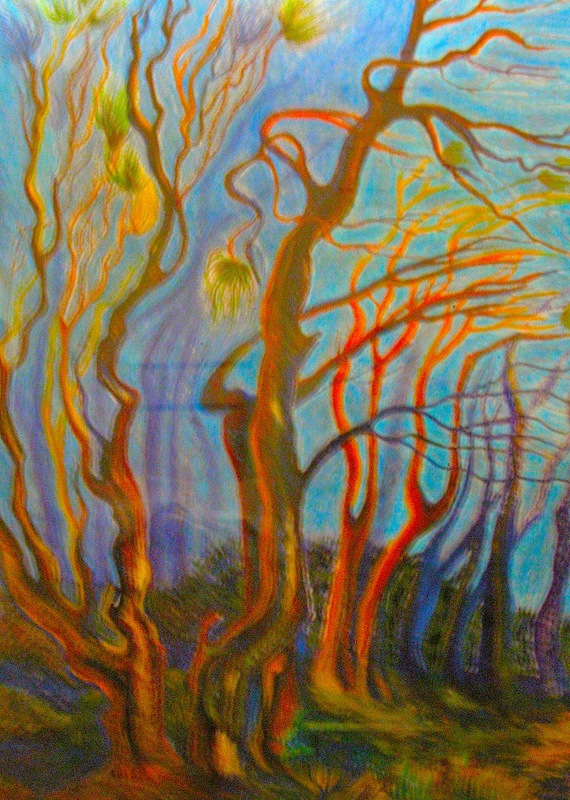 Fern York – pastel on paper pieces created to raise awareness for our unique South West forest ecosystems. Natalia Fidyka – a talented photographer who captures moments as they arise and finds beauty in unseen places. Petal Pixie – her work is an exploration of her relationship with plants, the natural world they inhabit and the unseen energetic world. Samantha Lostrom – acrylics and oils that demonstrate a strong interest in animals and nature, which are the source of inspiration for almost everything she creates. Susanne Parker – in her piece for the Exhibition called Cow 631, Susanne hopes that the viewer will see the cow as an individual sentient being rather than something used to produce a product; a “milk machine”. Wayne Cherrington – intricate and very beautiful mosaics of birds, fish and reptiles. In 2003, I spent four months living with the Chandel family in Khajuraho, India. It was an amazing time of my life. Khahuraho is World Heritage site, famous for the intricate Karma Sutra temples, built by the Chandella dynasty. The Chandel family are direct descendents of the Chandellas, who ruled over central India for half a millennium. The Chandellas built the famous temples of Khajuraho between the mid-10th and mid-11th centuries. While I was in India, I was influenced by Buddhist, Muslim and Hindu artworks and culture, especially that of the temples. On this adventure I spent two months living in Kathmandu, Nepal. In Nepal, I saw one mountain of Tibet. Sunny’s Organic Cafe, Maitland Road in Islington, Newcastle NSW. This collection of works in a range of mediums, is inspired by the fragile biodiversity of native forests. 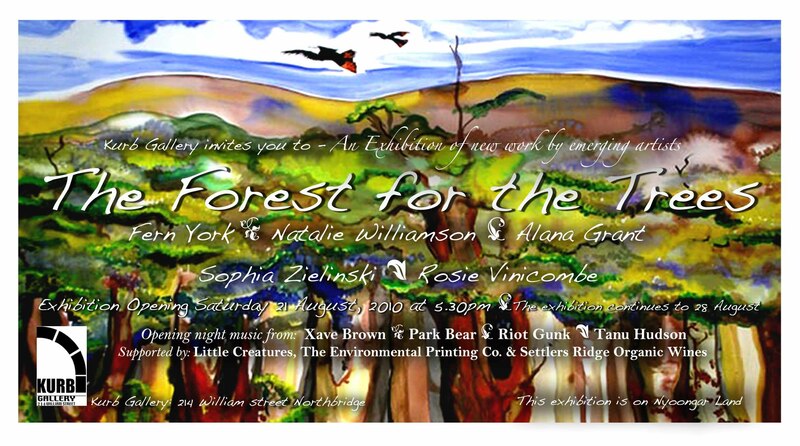 The artists hope to evoke appreciation for our unique bush landscapes and to remind us not to take these forests for granted. Music by: Xave Brown, Park Bear, Riot Gunk & Tanu Hudson. Thanks to our supporters: Kurb Gallery, Little Creatures, The Environmental Printing Co & Settlers Ridge Organic Wines. A marine themed Art exhibition in Victoria Park. All work on display is for sale to support both the Artist’s and the campaign to protect our unique South West Marine life. The exhibition is an awareness raising and fundraising event for the Save our Marine Life campaign. Save Our Marine Life is an unprecedented collaboration of Australian and international conservation organisations working to protect and secure Australia’s unique marine life. Less than 1% of WA’s South West marine life is protected. Our political leaders will be making big decisions about this in the next couple of weeks – we need to make it clear that 1% protection is not enough. Where: Victoria Park Centre for the Arts at 12 Kent St East Victoria Park. When: Opening night is at 6pm on the 14th of August. The work will be on display on both the 14th and 15th of August.